Is it Monday already? That weekend went by way too quickly! Did you guys have a good holiday weekend? In addition to being Easter yesterday, it was also our wedding anniversary – 6 years! It seriously feels like just yesterday I was stressing over wedding vendors and the guest list 🙂 As has become our tradition, we went out to lunch and then cooked dinner at home together. I made cupcakes to celebrate too, I’ll tell you more about those later this week! Oh, and also? Since the season 3 premiere of Game of Thrones was on last night, HBO was having a free preview weekend. That means instead of the super productive Saturday I had planned, I had a Girls marathon! Cranked through the entire season – not sure if I should be proud or ashamed of that… It was so much darker than season 1, but I still loved it. In between episodes, I also spent a few minutes whipping up these amazing Peanut Butter and Banana Nutella Swirl Muffins. I’d seen them on Jessica’s blog a few months ago and made a mental note that they had to happen the next time we had brown bananas hanging out on the counter. I may have purposefully been a little overenthusiastic in my banana buying the past few weeks in the hopes that some would become dark brown and speckled before we could eat them just so I could finally make this recipe. It definitely didn’t disappoint! I figured with peanut butter chips and Nutella in the muffins, I needed some way to justify them as breakfast, so I replaced some of the all-purpose flour with whole wheat. 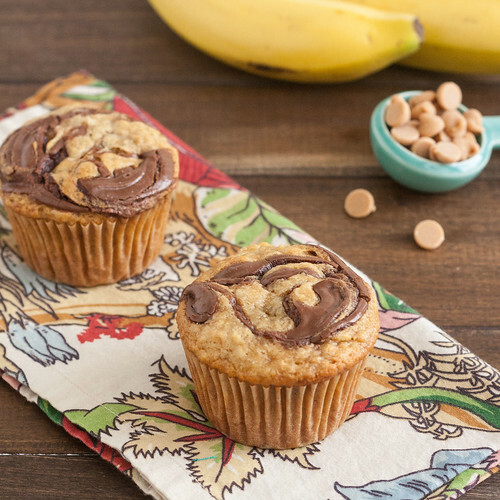 Whole wheat and bananas balance out the peanut butter chips and Nutella – that’s how this works, right? 🙂 I used white whole wheat flour and I swear, you’d never have guessed these were whole wheat. The muffins are light and tender, with lots of banana flavor. The Nutella swirl, not surprisingly, was my favorite part – so pretty and just a little decadent. I sent these off to work with Shane because I couldn’t keep my hands off of them, and I’m already looking forward to the next time I find brown bananas on the counter. Preheat oven to 350 F. Line two muffin pans with paper liners. Whisk the whole wheat flour, all-purpose flour, baking soda, baking powder, and salt together in a medium bowl. Combine the mashed bananas and both sugars in a large bowl and whisk until incorporated. Add the egg, canola oil and vanilla to the banana mixture, whisking until evenly combined. Add the dry ingredients in three additions, mixing just until incorporated (I started with a whisk and switched to a rubber spatula at the end). Stir in the peanut butter chips. Bake the muffins for 18-20 minutes, or until a toothpick inserted in the center comes out clean. Transfer the muffin pans to wire racks and let the muffins cool for a few minutes in the pan before removing them. 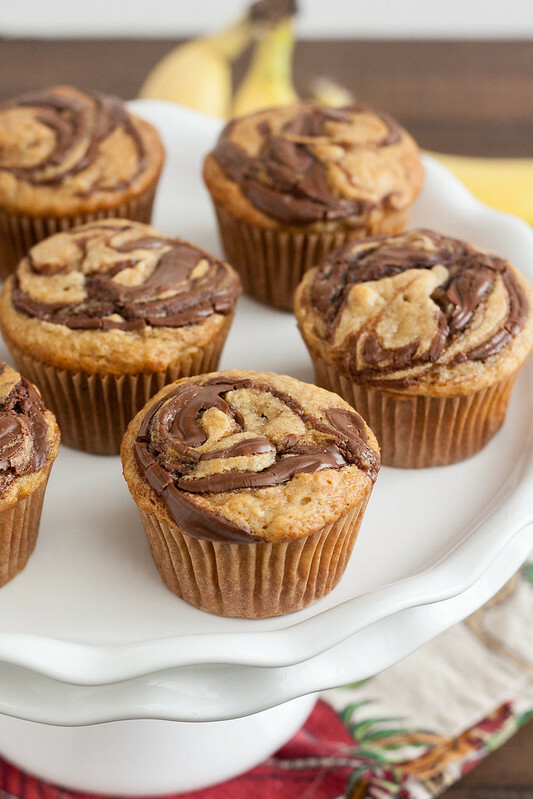 25 Responses to "Whole Wheat Peanut Butter and Banana Nutella Swirl Muffins"
The only thing better than peanut butter or nutella alone is the two combined! These muffins look too amazing. Even though I couldn’t let a speck of these in the house – I want one SO bad and that swirl is just perfect! I loved the Girls season 2 finale, what did you think? I have these bookmarked from Jessica’s blog too! Need some brown bananas asap! Oh yum these are awesome. And congrats on 6 years! Happy Anniversary! Sounds like it was a great weekend. These muffins are so beautiful! I’m so excited that Game of Thrones is back! I’ve had Jessica’s muffins pinned for a while now, and I have to say, yours look absolutely perfect, too! I always add half whole wheat flour when I bake muffins, so I love that yours are on the healthier side too. I think I just pushed these up on my to-make list. I need to make these asap! YUM! Now this is my kind of muffin! I love the flavor, they look so delicious Tracey! Happy 6th anniversary! These muffins look like the perfect way to celebrate. Love anything PB + banana! Don’t you dare get me interested in a new show! I’m still catching up with Downton Abbey and Mad Men. These look so rich and delicious. Love them! Congratulations on 6 years!! And you should send me some of these muffins, FYI. 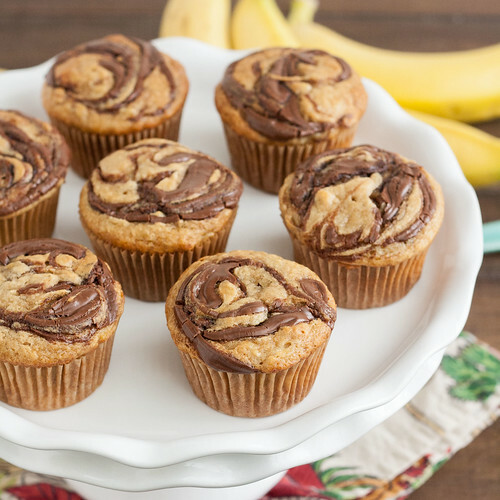 Your muffins look and sound delicious, can’t go wrong with banana, peanut butter and nutella! Kicking myself for not getting those peanut butter chips when I was at the store because these look AMAZING! These sound awesome! I love that you substituted in whole wheat flour for the white flour. Oh yum, these look delightful and really filling! Wow! Happy Anniversary! We watched Game of Thrones Sunday night, and definitely watched my fair share of HBO movies last weekend! (Ive tried to watch Girls, I couldn’t get into it..is it that good, should I try again?!) These muffins look and sound fabulous..how do I never have nutella around?